In the morning after I wash my face, I like to follow up with this cleansing toner from Botanics. I feel like my skin glows after using this and I like that it doesn't make my skin feel dry and tight. 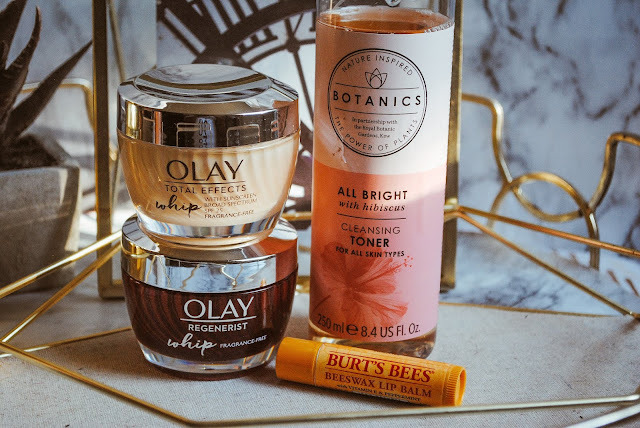 After letting that set for a few minutes I'll follow up with the Olay Whip Fragrance-Free Total Effects moisturizer with SPF 25, for venturing outside the house, or the Olay Whip Regenerist Fragrance-Free moisturizer for lounging around the house. Both provide incredible moisture and don't leave my skin feeling super greasy (you can read my initial review on both of them here)! My go-to lip balm, day or night, is the Burt's Bees Beeswax Lip Balm with Peppermint; it's so refreshing and lasts for a long time. 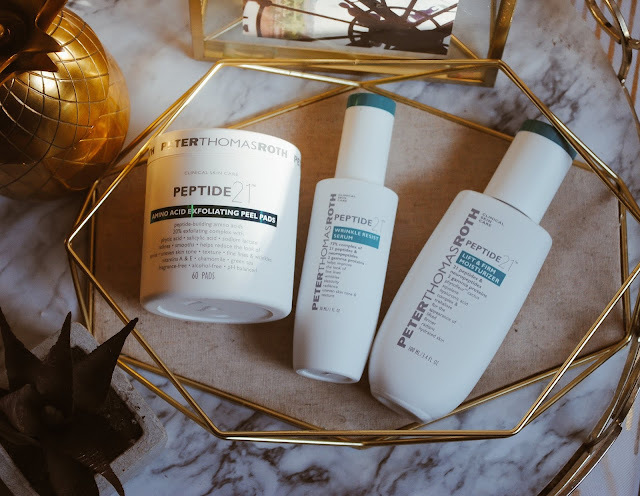 Just before bed I wash my face with the same cleanser I use in the morning (Noxzema Classic Clean Moisturizing Cleansing Cream) and use the Peter Thomas Roth Peptide 21 Collection. This has been my new secret weapon for amazing skin! One day a week I use the Amino Acid Exfoliating Peel Pads to exfoliate and prep my skin for the products I use after. Step two is the Wrinkle Resist Serum, then my favorite eye cream from Avya Skincare, and last is the Lift & Firm Moisturizer. I can honestly say that my skin has improved 1000% since I've started using this skincare routine. 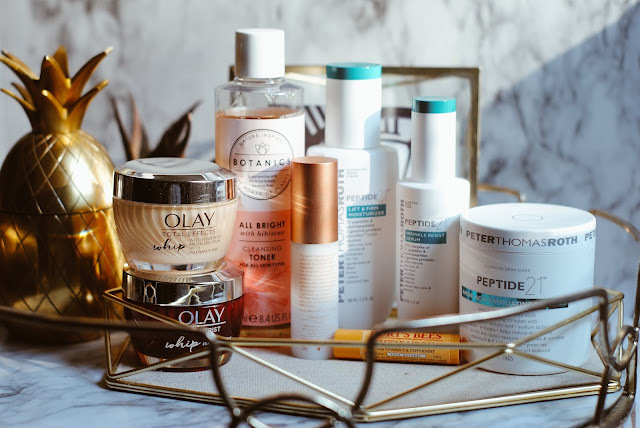 The Olay moisturizers and the Peter Thomas Roth Peptide 21 products are definitely staple products that I'll continue to buy over and over again. 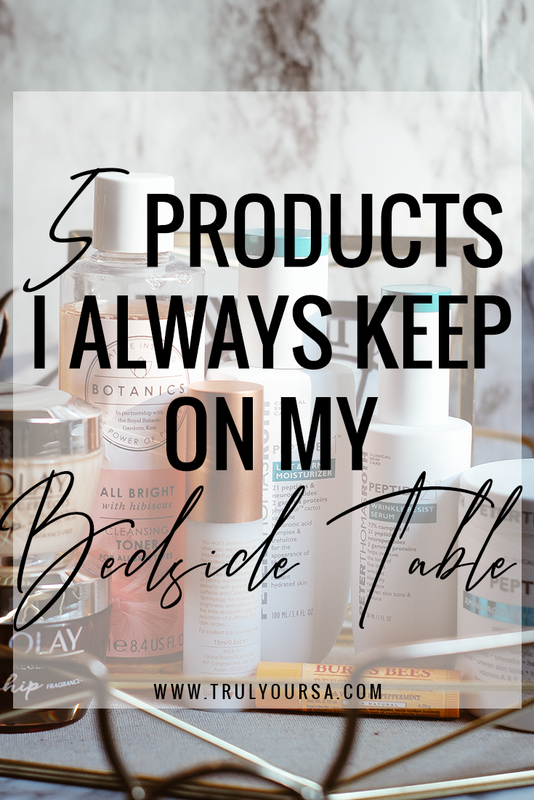 What products are must-haves in your skincare routine? Sound off in the comments below and don't forget to share this post!